Okay. I am pretty sure you may have just rolled your eyes at me. I only know this because I used to do the same if someone told me my kids would ever drink anything that shade of leprechaun green. I also know that you rolled your eyes because I am the “Queen Bee” of eye-rolling. Ask my Mom. And my husband. They both will gladly defend my title on this one. But…I promise…This mixture actually tastes really good. I happen to have two kiddos in my house who both agree, as do some of their friends even. And just for the record, this is definitely more of a “juice” than a “smoothie”. I find my kids like it as a thinner juice far better than a thicker smoothie mixture. Here’s the deal. It may not be an overnight process. It might take a week. It may take 3 months. In fact, I highly recommend the low and slow 3 month method on this one. This is my little trick … just put one little sip in the glass the first time. That’s it. Just tell them to try one sip and no more. The next time? Do the same. And the next time? Yup. Same again. And then again. You can gladly drink up any extras yourself. But, just one sip. Any kid can do one sip of something. Give them a funky fun straw and they won’t even notice they drank it. After a few times, add a little more. Then some more. Then some more. Before you know it? Their palates will be used to the new healthy flavors and they will soon be able to down a whole glass of this alkalizing detoxifying juice of health! 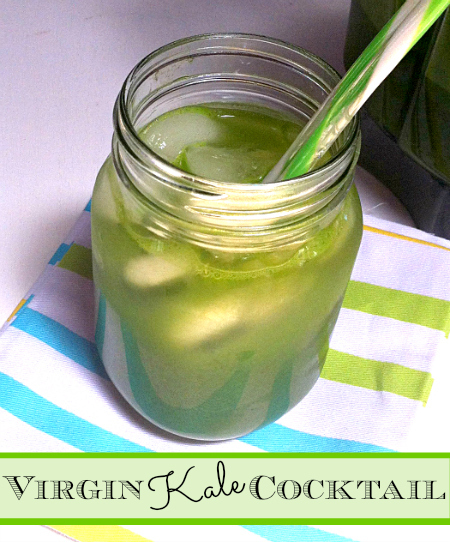 I know it is not always easy to incorporate enough greens into your day, so finding tips and tricks along the way ALWAYS helps…so I have another one for you in case you still aren’t sold on the fact your kids (or you) will drink my Virgin Kale Cocktail above. And no. It does not involve adding liquor to it…although that’s not such a bad idea. Recently, my trainer, of Jeremy Scott Fitness fame, introduced me to a product called pHresh Greens. I absolutely love what this company stands for. I talked with the guys behind these greens recently because I was wanting to verify that their products and their lines were truly Gluten-Free Dairy-Free, Egg-Free, Nut-Free, and Soy-Free (great news…THEY ARE)… and the passion and excitement these guys have for health and their products is amazing. “pHresh greens® is made with 16 raw ingredients that were carefully selected for their high pH levels. It is a full spectrum alkalizing superfood blend of energy rich vegetables, and sea algae. pHresh greens® is highly bio-available and provides your body with a rich natural source of vitamins, trace minerals, chlorophyll and other phytonutrients beneficial to health. **Please note that I have absolutely NO financial affiliation with this company. I just truly love this product and the stamp of health that they stand for. 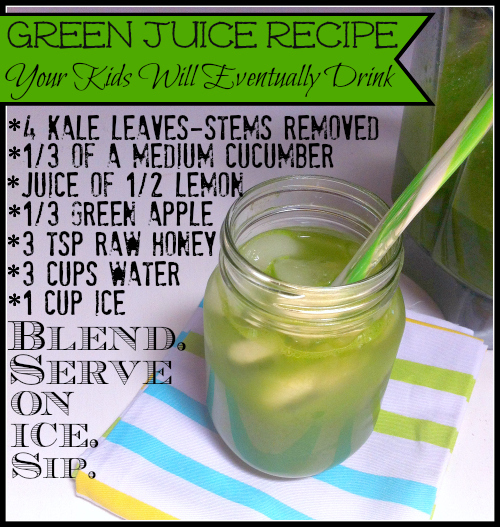 And, if you decide you just can’t get your kids to drink my little concoction I mentioned above, then this is a GREAT alternative for you. 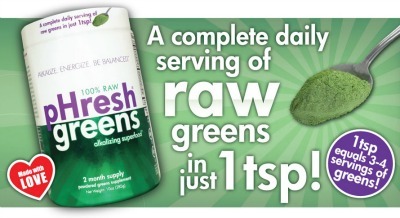 Just 1 tsp, added to any smoothie, will give them (and you) a COMPLETE daily serving of RAW GREENS! That is my type of workout. Short and Sweet. Jeremy knows how to speak my language…AND deliver awesome results! Oh, and if you are not in Phoenix, he also has an awesome fitness program for you to do on your own time at home. Summer is just about here – time to get FIT and HEALTHY!! I never thought of adding a cucumber. My little one year old is a picky eater but he will always drink a green smoothie in the morning, thank goodness because he won’t touch anything green! Our standard is a banana, orange, strawberries, and spinach. Yummy stuff! Wow! Suzie, you are lucky your 1 year old is already digging the green smoothies! Way to start him out early! 😉 At least you know that if he is picky about other things, he is still getting some great nutrition from his healthy smoothies!! Curious-has the pHreshGreens been tested gluten free? There’s just so much controversy about wheat/barley grass and when it’s harvested vs. gluten content, blah….and I didn’t see anything about testing on their site, although I could have missed it. And that green juice looks suspiciously like the one I make so my husband drinks it too! No kid in this house will touch anything green, but maybe I can add some summer blueberries!